The only book dedicated to the College of Emergency Medicine's Membership examination, this book contains numerous questions and answers, together with data sets and clinical examples to help prepare candidates taking part B of this and other higher examinations in emergency medicine. All trainees wishing to pursue a career in Emergency Medicine have to have to pass the College of Emergency Medicine's own membership examination (MCEM) to enter training and pass the Fellowship examination (FCEM) to complete their Certificate of Specialist Training (CST). This book is a study guide which can be used in conjunction with standard emergency medicine texts. It follows the MCEM syllabus exactly and each chapter has three key parts: core facts which supplements revision for parts A and B, clinical scenarios, including data, which can be used to prepare for part B, and sample answers for questions. 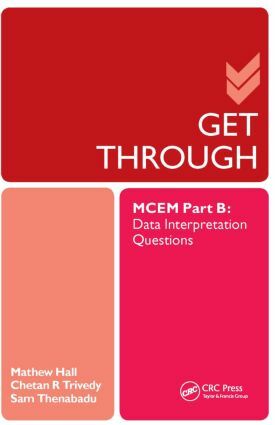 This book prepares candidates for examination success in part B, the data interpretation part of the MCEM examination. The authors are doctors all dedicated to the acute or emergency setting and who have collated extensive material to help in candidates' preparation for the MCEM examination. They have run a successful revision course for candidates taking the examination.